The Kryptos sculpture was commissioned for the CIA's New Headquarters Building in 1988, and dedicated in 1990. A common misconception is that it is composed only of the one "wavy screen" piece -- in actuality there are several pieces, and sculptor Sanborn describes them as being in three main sections: Courtyard Plaza (which includes the sculpture), Courtyard Lawn, and Entrance. For orientation: The brownish tiered section in the center of this photograph is the roof of the New Headquarters Building. The building on the right with the white oddly-shaped roof is the cafeteria. There is a wall of windows on the left side of the cafeteria (though you can't see them in this photo) which allows employees to have a view of the Plaza and Lawn as they are eating. The Kryptos sculpture is in the northwestern area of the Plaza. From the far left of the photo is a walkway leading into the New Headquarters Building. Other stone slabs created by Sanborn line this walkway (but are not easy to see in this image). This is the one that gets all the attention and excitement. For better pictures of this, more information about the code, and lots and lots of links to more information, please see the Kryptos webpage. Sanborn's description: . . . In the interior courtyard on the concrete plaza is a large free-standing copper screen perforated with text which was encoded by a complex system and is a challenge to the agency. The petrified tree supporting this screen on one end recalls the trees which once stood on this site before construction began and was also wood at one time and the source of the paper on which the encoded text was originally printed. The geological reference here helps to contextualize the Agency's work, it aims to fit that work into the huge framework of geological time, which demonstrates both its pervasiveness and its potential for obsolesence [sic]. The green semicircular park area was designed by Sanborn. 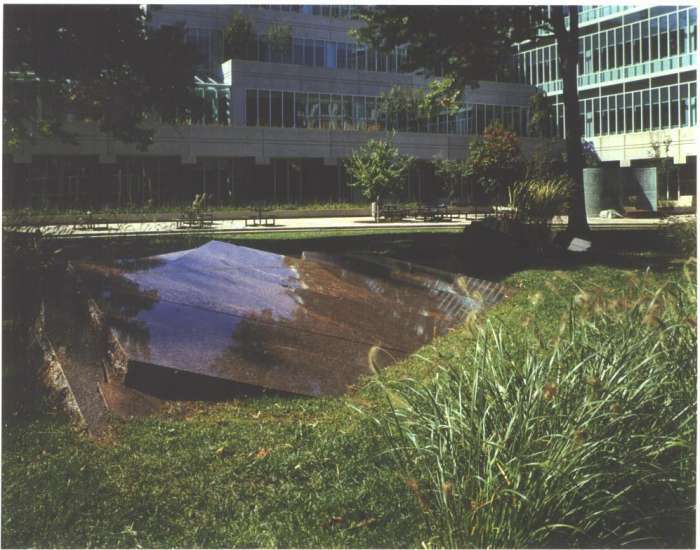 The Kryptos sculpture sits in the northwestern Plaza portion, plus there is a bird-pond and some stone slabs in the green semicircle (Courtyard Lawn) on the right. The small grey dots around the plaza are freestanding lunch tables. 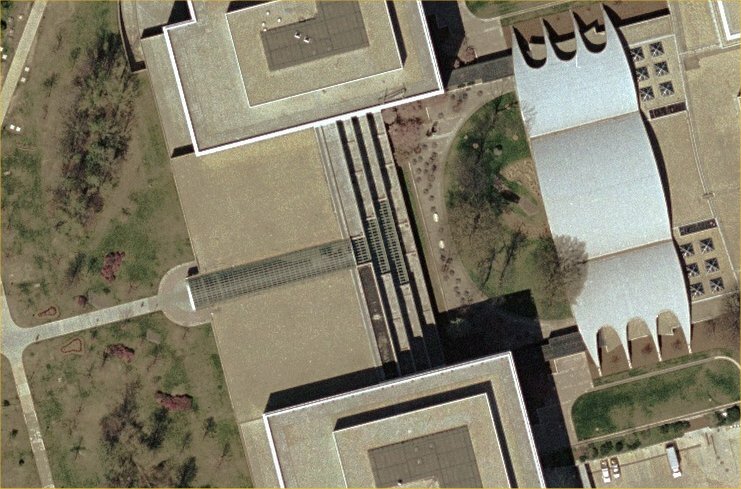 The decrypted Part II section of the Kryptos sculpture contains latitude and longitude coordinates, and it is believed that those coordinates point to somewhere in this Plaza area, probably in the area of building shadow towards the south of the plaza. See Xenon's page for one calculation of where the coordinates may point to. Sanborn has said that the coordinates point either to that area of the courtyard, or possibly to an area south of the compass in the front entrance section. This photo was taken during a season when there were no leaves on the trees. If you look closely though, you can still see the shadows of tree trunks and the outlines of branches. 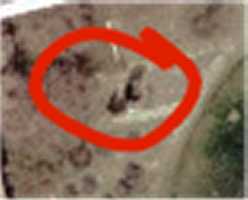 You can also click on the image to see an enlarged photo of the area (it's a little fuzzy though). Though not clearly visible in this image, large stone slabs line this walkway. Some of the slabs have a sandwiched sheet of copper with various morse code messages. Another has a large engraved compass which seems to be pointing at another stone nearby, which may be a lodestone. Please click on the image to see an enlarged version. If you look closely you will see what appear to be the lampposts lining the walkway, but keep in mind that these are the shadows of lampposts. The length and orientation of the shadows may be useful though in pinpointing the location of some of the slabs, from the other pictures available (that also have shadows in the background). Sanborn's description: ...the first of three elements of this work. We see a large "natural" stone outcropping running parallel to the facade, through which the main walkway passes. This outcropping is composed of 12" - thick slabs of granite. Between two of these layers is a "seam" in geological terms of green copper plate. The top of this plate which is exposed in several places is perforated with International Morse code, the simplest of all codes. This text can be deciphered easily by those familiar with Morse. This is a close up (courtesy of Jim Gillogly) of some of the slabs with morse code messages. 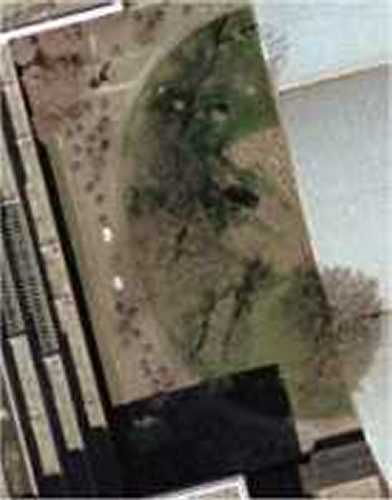 It's located near the north side of walkway in the above image, somewhere in the middle (we're not sure exactly where, but the lamppost shadow and other features in the background may eventuallly help narrow it down). Morse code messages that have been observed include SOS, LUCID MEMORY, T IS YOUR POSITION, SHADOW FORCES, VIRTUALLY INVISIBLE, DIGETAL INTERPRETATU, and RQ (or maybe YR if you look it from the other direction). There are also several other dots whose purpose is unknown - speculations include: the possibility that they're just "placeholder" dots to fill out the line; the letter "e" repeated over and over; or extra dots which may help spell out a different word if the morse code is scrambled and/or looked at from another direction. For more information please see Gillogly's pictures, Elonka's 'Morse Palindrome' blog, and David Wilson's Kryptos Morse Code page. This is a close up of the compass (also courtesy of Jim Gillogly) that's on one of the slabs. We're not certain on exact location but it's somewhere on the south side of the walkway, in the green area near the entrance. One report is that the "north" direction on the compass rose is pointing roughly south-southwest (around 220 degrees) but this is not exact. The needle of the compass appears to be pointing towards another small stone nearby, which is probably a magnetized rock, or lodestone. For more information about lodestones, check here. It is also worth noting that similar compasses appear on two other Sanborn works in the DC area, which were created just before Kryptos: Invisible Forces in Arlington, and Find the Lodestone in Bethesda. If by any chance you have visited this area and can help with identifying where exactly these various pieces are located, or which way they are oriented, we would appreciate any eyewitness accounts. You can write to the webmistress and request to have your comments remain anonymous if you would like. We just want to make the most accurate map possible of the Sanborn artwork! November 10, 2003: Modified some information about the courtyard area based on an interview with Sanborn.